If you are interested in the Emerald Tablets, you are probably confused about their content and where they come from. Well, you do not need to worry because, in this article, we will outline to you what we have gathered so far about the Emerald Tablets based on our research. There are actually different narratives pertaining to the origin of these tablets. 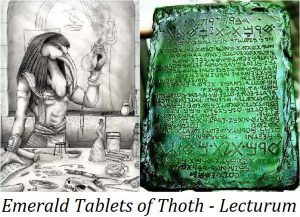 There are websites like Crystal Links that claim the tablets are at least 36,000 years old and were made by Thoth, an Atlantean who ruled Ancient Egypt for 16,000 years. The tablets were taken to South and Central America by the ancient priests who founded the Mayan civilization. Eventually, though, they were returned to the ancient hall of records beneath the ancient Sphinx. On the other hand, sources like Wikipedia, which has become the Internet’s default encyclopedia, tells a different story of the tablets. Their legend grew because they were written about in Arabic books that were published between the sixth and eighth centuries. These books were not original books, they were a composite of different materials handed down from different sources through the ages. These books eventually found their way to Greece, where the so-called Hermetic tradition grew. Out of this came the practice of alchemy in the Middle Ages. Whichever narrative you believe about the origin of the tablets of Hermes and Thoth, there is no escaping the fact that their content is powerful – and cryptic. You need to read them a hundred times and interpret them according to your intuition. But the first teaching is probably the most powerful. It says, “As above, so below”, which actually refers to the inner and outer experience being one and the same. In other words, when these words are applied to humans, the inner conditions of a person will determine the kind of experiences he will have in life. If that echoes The Secret and the Law of Attraction, it does. The tablets, though, do not speak of the Law of Attraction. Rather, it speaks of prime material being formed into different solid materials in the physical world. The earliest known followers of the teachings of the emerald tablets were the alchemists of the Middle Ages, all of whom tried to turn to gold the different chemicals and elements being used at the time. In modern times, there are no alchemists, only people who want to be super manifesters.